For those looking to exercise regularly but suffering from chronic joint pain, roller skating may be an excellent option to consider. Compared to more mainstream forms of exercise like running or jogging, roller skating is a great alternative, as it provides the same aerobic benefits while causing less joint pain. Plus, if you have kids, it’s a great way to get active outdoors as a family. Read on to learn more about the benefits of roller skating, and consider adding this fun activity to your workout regime for National #RollerSkatingMonth. Roller skating is a great way to get in your aerobic exercise if you are looking for something that is easy on the joints but also burns a lot of calories. 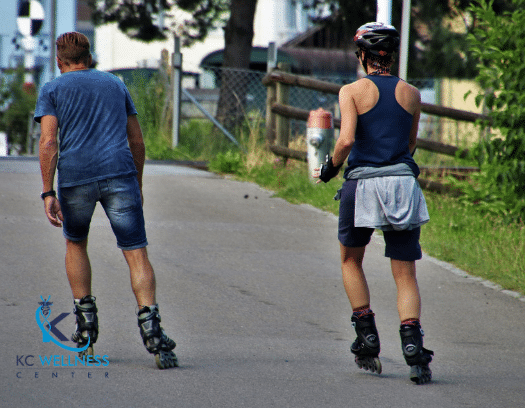 According to the Roller Skating Association International, studies show that roller skating engages many different muscles in the body. When you skate, you are using your legs to propel yourself forward, your core is engaged in order to maintain balance and if you use your arms to gain momentum, you are also using your upper body. Incorporating roller skating into your regular workout routine can help build muscle and increase muscle endurance. Perhaps one of the best reasons to roller skate for exercise is that you’re burning calories while having fun! After just 30 minutes of skating, your heart rate may increase to 148 beats per minute or more, and you can increase it even higher if you skate more vigorously. According to Diet and Fitness Today, in that time the average male weighing 190 pounds would burn 530 calories. If you were to skate for an hour, you are likely to burn an average of 1,060 calories for males and 909 calories for females, depending on how vigorously you are skating and how much you weigh. For those who have stiff joints, this fun and unique form of exercise is a great option to try! Keep in mind that it does come with the chance of injury, so make sure you adequately assess your risk for injury. If you are prone to falling, you can wear knee pads, elbow pads, wrist guards, and a helmet. According to the American Orthopaedic Society for Sports Medicine, the most common injuries are to the wrists, but wearing wrist guards can decrease your chance of injury by 87 percent! Try this form of exercise to shake up your routine in honor of National #RollerSkatingMonth. Those who suffer from persistent joint pain may also benefit from platelet-rich plasma therapy. To learn more, call us at (816) 214-5276 or visit https://bit.ly/2ImSbAn . Posted in Uncategorized and tagged activity, elderly, Exercise, Fun, joint pain, Low-impact, pain, roller skate, skating, work out, workout.